We know now that on May 15, 2005 while acting as CLICO’s lawyer, David Thompson signed a secret contract between CLICO and Leroy Parris’ private company that in effect deceived shareholders into believing that Parris was being paid less than he really was. After the CLICO house of cards fell, CLICO told the government Oversight Committee – a toothless creation of Prime Minister David Thompson – that the company had no record or knowledge of the Clico’s contracts with Leroy Parris. Prime Minster David Thompson kept silent although he knew the truth. 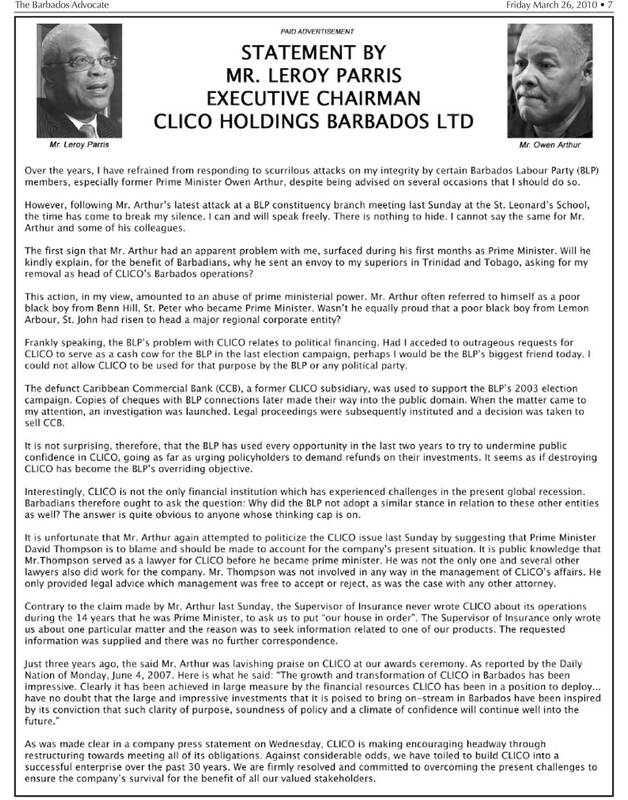 Those who say that Thompson had to keep silent about a matter that happened when he was CLICO’s lawyer only emphasize how unethical it was for Prime Minister Thompson to be hands-on during the CLICO meltdown as he was. It was fine for David Thompson to maintain the client confidentiality of something he did when he was a lawyer. It was unethical for him to insert himself into the workings of the CLICO oversight while he was still protecting CLICO and Parris. I am sorry to say that David Thompson – the man who promised us transparency, ethical government, Freedom of Information legislation, Conflict of Interest standards and integrity legislation – betrayed us in his words and in his deeds. David Thompson chose to protect CLICO and his friend Leroy over the interests of the people of Barbados and other CLICO shareholders and victims. … from an advert published by Leroy Parris on Friday March 26, 2010. I read your spirited March 26, 2010 advert where you say that Owen Arthur wanted CLICO to serve as “cash cow for the BLP” in the 2007/2008 Barbados election campaign. From the little information that has appeared in the media, we know that CLICO and CL Financial gave big money to politicians in the Caribbean, but we don’t know how much you, your family, CLICO or associated companies gave in Barbados over the last, say, 10 years. Well, Mr. Parris? How much money did CLICO and its associated companies channel to David Thompson and the DLP over the last 10 years? This is our formal invitation to you Mr. Parris: If anything we’ve said is incorrect, write us from an email address that we can confirm is yours and we’ll publish what you have to say without change or comment, and allow you to communicate with the same audience that read this article.